Product prices and availability are accurate as of 2019-04-15 15:51:38 UTC and are subject to change. Any price and availability information displayed on http://www.amazon.com/ at the time of purchase will apply to the purchase of this product. 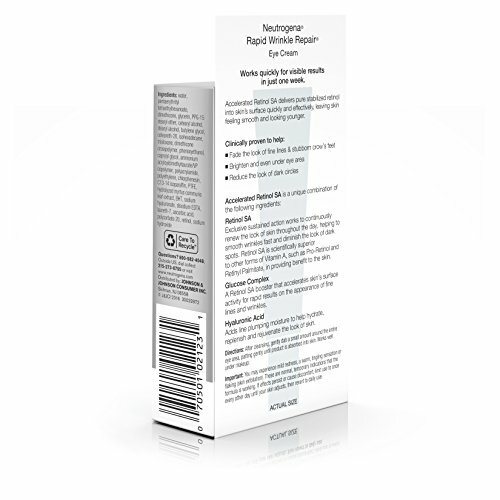 Help improve the signs of aging with Neutrogena Rapid Wrinkle Repair Eye Cream. 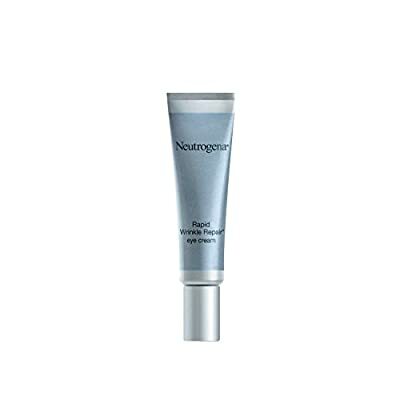 Specially formulated for the delicate eye area, this fast-acting retinol cream helps fade the look of stubborn crow's feet, brightens and evens skin tone in the under-eye area, helps smooth fine lines and texture, and reduces the look of dark circles. It works quickly with visible results in just one week. 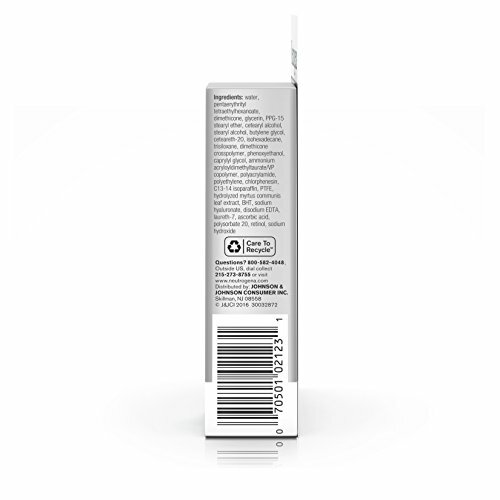 This formula contains accelerated Retinol SA with a unique combination of ingredients and is clinically proven to leave skin feeling smoother and looking younger. Retinol SA continuously renews the look of skin, helping to smooth wrinkles fast and diminish the look of age spots. Glucose Complex, a Retinol SA booster, accelerates the skin's surface activity for fast results. Hyaluronic acid within this eye cream adds line-plumping moisture to help hydrate, replenish, and rejuvenate the look of skin. 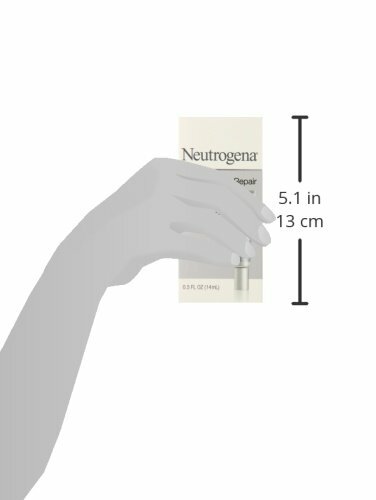 At Neutrogena, we're not anti-aging, we're anti-wrinkles. It's a new era in anti-aging. 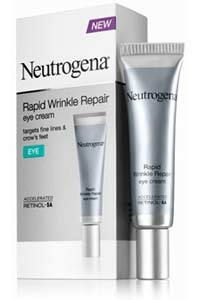 Neutrogena Rapid Wrinkle Repair Eye Cream contains Accelerated Retinol SA, for visible results in just one week. Accelerated Retinol SA combines an exceptional level of Retinol SA with glucose complex, an exclusive booster that delivers pure stabilized retinol into the skin's surface quickly and effectively, leaving feeling smoother and younger-looking. It's clinically proven to help: fade the look of stubborn crow's feet; brighten and even under eye area; smooth fine lines and texture; and reduce the look of dark circles. Featuring Accelerated Retinol SA - a unique combination of Retinol SA, Glucose Complex, and Hyaluronic Acid - Rapid Wrinkle Repair moisturizes and renews the look of skin, while helping to target fine lines and crow's feet. Exclusive sustained action works to continuously renew the look of skin throughout the day helping to smooth wrinkles fast and diminish the look of age spots. Retinol SA is scientifically proven superior to other forms of Vitamin A, such as Pro-Retinol and Retinol Palmitate, in its ability to penetrate the skin's surface. 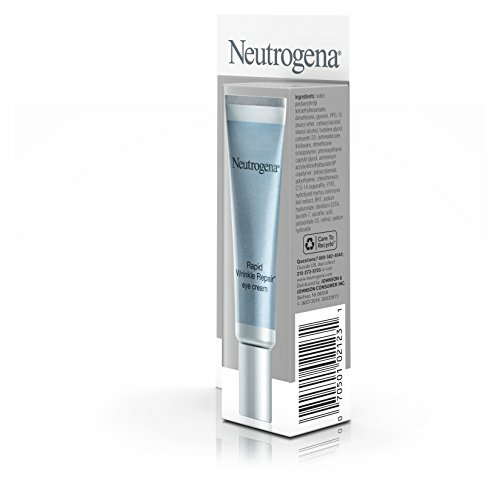 A Retinol SA booster that accelerates skin's activity for rapid results on the appearance of fine lines and wrinkles. Adds line plumping moisture to hydrate, replenish and rejuvenate the look of skin.